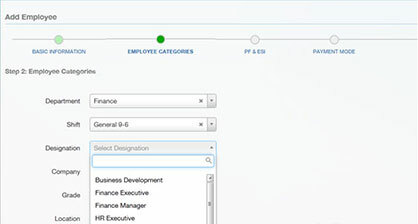 It’s now easy to have accurate and ready to use employee information in one central location. When you make changes to any information, you do it in one place and the changes are reflected everywhere. 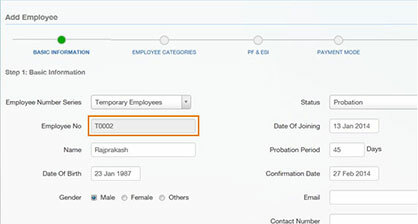 Moreover, the complete history of the employee in terms of transfers, promotions and other status changes is easily available. 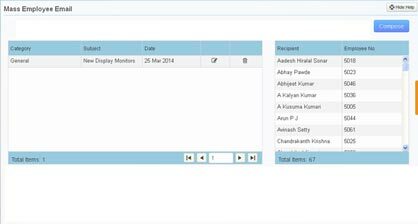 Track all the employee information needed by HR for various purposes under many different categories. You can keep a record of a variety of details including bio-data, photo, organizational details, qualifications, family, passports, and much more. You can create any number of organizational categories like Department, Location, Division, Function, Designation, Grade, Cost Center, etc for flexible classification and better reporting. 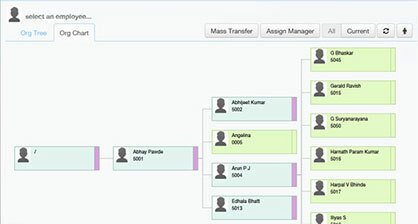 Maintain the organization tree to capture the reporting hierarchy. It can also be useful in various workflows for reviews and approvals. A complete history of previous reporting assignments is available. 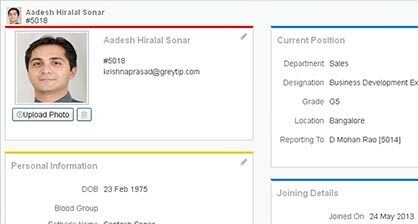 Generate a wide variety of employee letters like Address Proof, Confirmation Letter, Salary Certificate, etc. in just a few clicks. You no longer need to search for Word docs, update data from Excel files to generate the letters. Letters can either be emailed or accessed through the Employee Self Service. To help you setup letters, we have also included some commonly used letter templates. Just select them from the Template Gallery and start off. It is as simple as that! Employee Directory helps you in quickly browsing critical employee information and in easily locating employees. 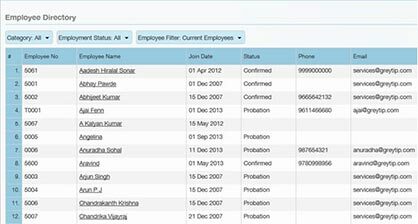 You can see the data for past and current employees with filters on various categories and employment status. Send mails to all or some of your employees. Particularly useful if you need to communicate information relevant to a specific department or location. Easy to use options to select the employees makes communicating with your employees a breeze! 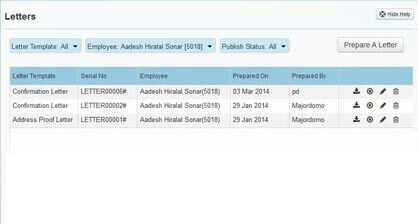 The automatic numbering system helps you maintain multiple employee series for different categories of employees without overlap. This great feature minimizes mistakes and save effort at the time of on-boarding employees. Get 100% accuracy and statutory compliance, effortlessly, every time. Get major cost savings, quality, and happy employees with employee self service.